Showerwall’s Azure Acrylic Collection adds a sophisticated pop of colour to the bathroom .. The rich and vibrant Azure from Showerwall’s Acrylic Collection adds a sophisticated pop of colour to the bathroom and offers a polished finish that looks like real glass to create a luxury aesthetic. Acrylics are 100% waterproof so do not require any trims for installation. Large areas of elegant decorative surface can be created as the panels are supplied with co-ordinating sealant that makes any joins inconspicuous, while still benefiting from easy installation and maintenance. There are eight décors in the Showerwall Acrylic collection, including bright statement colours Azure, Wine and Opal, neutrals in Arctic, Orchid and Mocha for more natural hues and Frosted and Gunmetal metallics with reflective silver tones that deliver the look of real metal. The 4mm solid acrylic panels are rear painted, giving them their vibrant colour and authentic glass-like finish. Ideal for use in shower enclosures, around baths, behind basins and to create statement feature walls, the high-performance, lightweight panels are available in two sizes of 900 x 2440mm and 1220 x 2440mm. The Showerwall range offers a broad spectrum of 66 nature-inspired décors in total. They are all available ex-stock nationwide from Ideal Bathrooms, IDS and Formula 1. 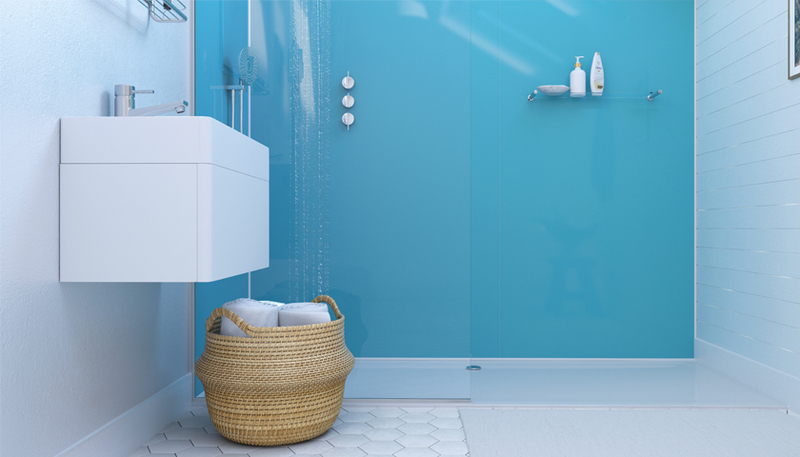 To find out more about Showerwall’s Azure Acrylic Collection please click here.